From a nominal five acres of rented land in 1981, the ECHO Florida campus has grown steadily to meet the needs of this expanding international organization. Through the years, neighboring plots of land have become available as homeowners sell their property. And each time God has graciously provided – through many of you – the financial resources to seize these opportunities to grow ECHO’s space. 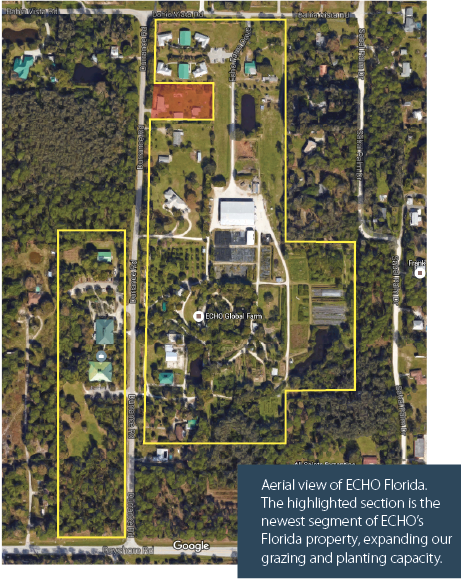 For the last 10 years, the ECHO campus has had a “keyhole” shape, as one parcel of land remained privately owned between the ECHO Global Farm and visitor housing. In many different ways, this “gap” was a challenge to the full, effective, and efficient utilization of parts of our campus. This parcel, highlighted in red below, is the “gap” property that recently became available for purchase. Through negotiations and prayer, ECHO and the property owners agreed upon a substantially reduced and reasonable purchase price. As word of this opportunity was circulated, a groundswell built. In just a few short weeks, 22 generous individuals and families contributed the funds needed to buy the property outright, pay the closing costs, and finance the site work needed to integrate the space into the rest of the ECHO campus. Once again God graciously provided – through many of you – and we were able to close on the property on April 1st! We are so grateful for this opportunity, and the support that enabled us to seize it. This new potential grazing and growing space will enhance the training and equipping that we do at ECHO Florida for years to come. If ECHO's mission around the world has inspired you, please join us to provide the resources to continue to make it possible. We need YOU to reduce hunger and improve lives around the world! For more information about tax-advantaged and planned giving, please contact David Erickson, Chief Organizational Development Officer, at 239.567.3323 or derickson@echonet.org.